used for a more formal miniature scenes. 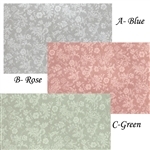 Damask comes in Rose, Blue or Green and has large floral pattern. MiniGraphics wall paper measures approx 18" x 11.5" high. 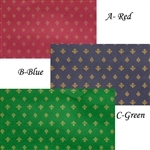 Majestic comes in Red, Blue or Green and has small pattern. MiniGraphics wall paper measures approx 18" x 11.5" high. Hyde Park comes in burgundy or blue stripe pattern. MiniGraphics wall paper measures approx 18" x 11.5" high. English Rose large floral pattern in rose and burgundy. MiniGraphics wall paper measures approx 18" x 11.5" high. Irise in stripe pattern of burgundy and blue. Brodnax Prints wall paper measures approx 18" x 11.5" high. Patina in stripe pattern of copper and bronze. Brodnax Prints wall paper measures approx 18" x 11.5" high. St George in blue pattern with border. Brodnax Prints wall paper measures approx 18" x 11.5" high.